Midgets, Moonpies, and Dawgs: I missed you today sweet girl! ... I walked by the Hello Kitty store and didn't have a reason to go in and look at all the fun pens and pads and stamps and bags. ... Izzy sat on Santa's knee and kept wanting to pull his beard. I kept thinking of how you would have explained Santa to her and helped her to not be afraid of him (she did really well though -- not scared at all -- you would have been proud). ... I walked by the big girl dresses and the cute Gap sweater I would have bought for you. ... when I saw matching pjs that you and Izzy could have worn together. ... when I ate my "chicknen" biscuit with "chicknen" on it for breakfast. ... I heard Frosty the Snowman on the radio and thought of that silly snowman that sings it that you loved so much. I'll have to show that to Izzy! ... when I bought your Christmas ornament for this year... I found it at Target (a friend had told me about it). It's a really cute butterfly and all the proceeds go to fund research for kids' cancers. That seemed pretty appropriate. I wasn't sure if I should get you an ornament this year or not... decided to for sure this year (you were here for the beginning of 2007 after all), and we'll decide about next year, next year. ... I was shopping for Izzy today. You would have had fun doing that (and probably would have had me breaking the bank for your sister!!). ... when I walked past Claire's and saw all the fun make up and lip glosses and fingernail polishes that you like so much. I miss buying that stuff for you!! I'm sure Izzy will be ready for it before we know it. I'm so thankful we had the 4 years and nearly 4 months with you that we did. What a gift!!! So... I'll try to remember that on days like today when the missing waves can be so strong! Go slide down a rainbow and send sweet dreams to our house tonight our beautiful girl. We love you so very, very much. Praying for you this season..Thanks for sharing your feelings with us. I know someone is smiling down tonight.!!! Jenn, You brought a tear to my eye. I can only imagine how bad the "missing" can be. Many, many prayers for you all through this season, and always. I will have to look for that ornament at Target, would love to have one on our own tree. Sliding down rainbows is how I picture Catie! Wheee What fun that must be. She always had that little sly smile that meant she was up for a fun time! I am sure that she is squealing with delight and waiting, as you are, for the day when you can slide down with her. :-) I do pray for you all daily and hope that in the "missing" moments, you can have the feeling of God's love wrapped warmly around your hearts. I loved the Izzy video! To cute! Please do share more! I also love when you are able to share videos, pictures, thoughts, and such of Catie. Warm fuzzies and hugs to you all.....I would love to see Izzy sitting on Santa's knee! Praying for you this season. As Tania said above, sliding down rainbows is how I picture Catie! Thanks Jenn for continously sharing your thoughts of Catiebug and also sharing Miss Izzy with us all. You are such an inspiration in my life. She is soo cute! May I ask how you put these on your blog? I started a blog to share w/ my family because we live so far away and I would love to learn how to add this to mine. Thanks, Jolene! Love you my friend! 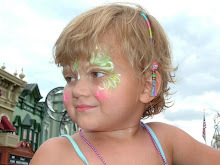 Thanks for sharing - you are loved by so many and we love your memories of Catiebug. I'm sorry you have to miss Catie like this, but I'm glad for you that she is present in so many ways...even in the little things like Hello Kitty and lip gloss. I look at Samantha sometimes and try to think of all the things I'd miss about her. I never like to let my mind go to that place, but because of people like you, I do on occasion. And when I do, the emotions take my breath away. I'm grateful for all you've taught me through your daughters. It makes me a better mom.